Following the results of participation on The 11th International Exhibition “Cryogen-Expo – 2012” in Moscow the Bestobell Valves management made a decision to penetrate Russian market. Bestobell Valves is a world leader in the design and manufacture of cryogenic valves, recognised globally for product quality and innovation. Our valves are used with numerous cryogenic liquefied gases including oxygen, carbon dioxide, nitrogen, liquid natural gas (LNG) and argon. Bestobell Valves manufactures for a wide range of applications and in a comprehensive range of materials. All valves are degreased for oxygen duty, assembled in clean room conditions and pressure tested prior to despatch. Bestobell Valves supplies almost all kind of cryogenic valves, regulators and other control devices. Bespoke solutions for client problems such as manifold designs, stub and pipe elbows, customer specific valve configurations. Using the Bestobell Valves products it is possible to create a cryogenic system of any complexity, to equip any cryogenic tanks including static storage, mobile and marine. 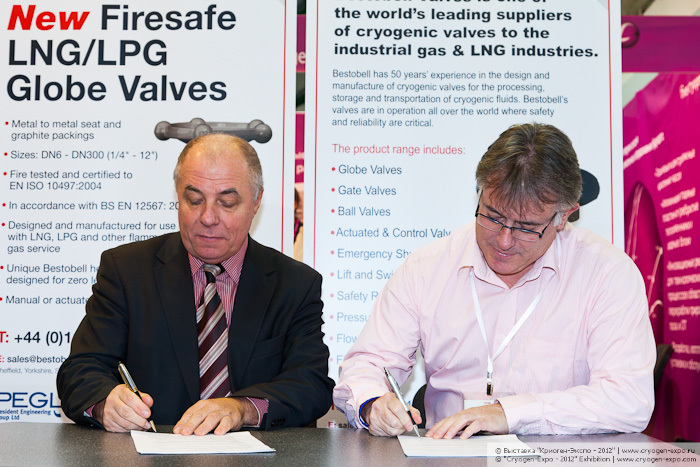 Fire safe variants of valves are available (by design, materials and tested!). Bestobell Valves products meet most exacting demands. Outstanding performance of the products is achieved by the combination of unique design and high quality manufacture. Therefore Bestobell Valves guarantees safety, reliability and durability of supplied valves operation almost without maintenance. 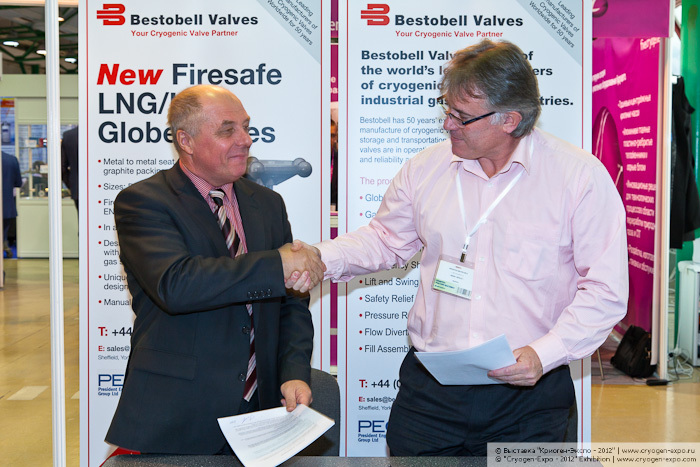 Bestobell Valves ensures full QA/QC control - ISO 9001 2000 accreditation and PED97/23/EC approved. More than 50 years service history shows extended product life with reduced whole life costs. Bestobell Valves global representation enables to communicate the clients all over the world and to provide 24/7 technical support. На фото - Банников В.А. (ВК "Мир-Экспо") и Марк Хенли (Bestobell Valves) подписывают эксклюзивный договор о взаимодействии.